Our teams are doing extraordinary work demonstrating tremendous compassion while providing high-quality care for our patients and families. We take great pride in what we are achieving at Niagara Health – as a learning organization, always knowing we can and will do better! We are optimistic about our future: for our patients, communities, and those professionals who choose healthcare as their life’s work. Here are some impressive numbers! 800,000 patients sought care at Niagara Health. Second busiest emergency program in all of Ontario where almost 200,000 people sought care. We reduced emergency room visits by 10% for folks with heart and lung disease. We received Ministry approval to proceed to Stage 2 of our capital building plan. We sought and received additional funding to respond to surge in our ER’s …. opening and operating an extra 26 beds -- again serving more people. And for the fifth straight year, we have achieved a surplus … enabling us to pay that down our long-term debt. We also moved closer toward a healthier Niagara by partnering with others. We are sparking conversations about mental health and transforming care both within and outside our walls. We have assigned one full-time person to our paramedic colleagues at Niagara EMS to help them serve our collective mental health patients in community – avoiding Emergency Department visits when possible. We are funding a Nurse Practitioner in Niagara on the Lake and 12 convalescent beds at Pleasant Manor. We are partnering with Canadian Mental Health Association to bring addictions care together for more collaborative care models. We are innovating and establishing new models of care for our patients seeking Mental health and addictions care - supporting them to keep them on track. We are improving the way opioids are prescribed in Emergency Departments in Canada to treat pain especially considering the growing risk of long-term use. You will be hearing more about how a local physician on the Niagara Health team is leading important research in this field. We are developing Apps in-house to help bring patients’ health information right to their fingertips, and we will use Artificial Intelligence in ways we have never imagined. These are game-changing ideas that can improve the delivery of care in ways that are difficult for others to match. We are the first in Ontario to establish a community and patient engagement network – led by our community advisory members. A winner of the national quality award for a program which focuses on prevention of blood clots – one of the most common complications of hospitalization. Named a top performer by the Canadian Institute for Health Information for improving patient safety nationally by performing fewer low-risk caesarean sections. And just yesterday, Trillium Gift of Life advised that Niagara Health is an award winner when it comes to saving lives through organ donation. Thirteen donors made possible 40 transplants. An additional 93 tissue donors enhanced many lives through their donations. This is the second time Niagara Health has received this award. Our heartfelt thanks goes out to donor families; a beautiful tribute to your loved ones. 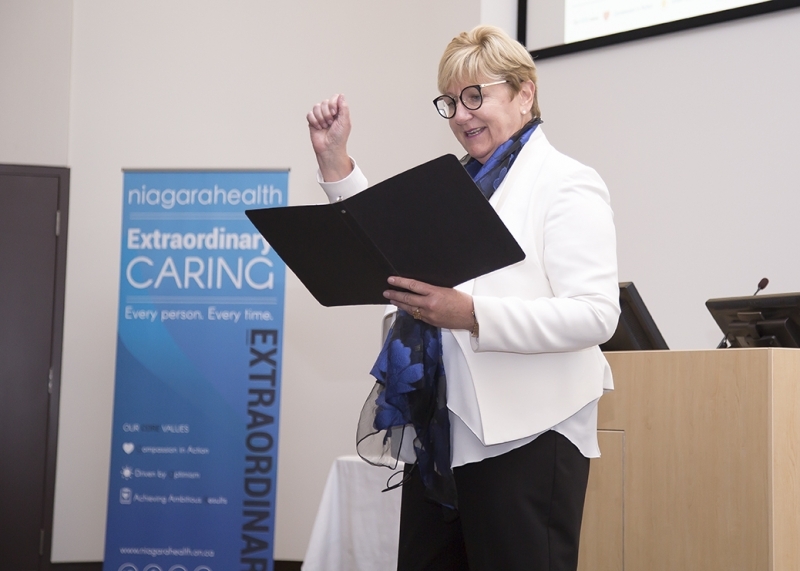 The team at Niagara Health is 6,000 strong – 4,800 staff, 600 physicians, and 850 volunteers – making us one of the largest – and depending on the day THE LARGEST —employer in Niagara. We are not standing still when it comes to creating a positive work environment and culture. Through our in-house Leadership Institute, we are developing our people; investing in skill development to better meet the workplace opportunities of tomorrow! Our teams demonstrate their giving ways supporting worthy causes like Niagara Health Foundation’s Big Move Cancer Ride, the Rankin Cancer Run and United Way. Our Acts of Kindness Workplace Challenge is spreading and so far, we have performed more than 10,000 acts of kindness. Let me tell you that when you wake up feeling a sense of gratitude and appreciation, you’re gonna have a better day. And you’ll smile more! You get the idea. It’s been an extraordinary year! And we are only getting started! I Am Niagara Health is another grassroots movement spreading across our organization. Already nearly 1,000 team members have publically pledged to live our CORE values and why. I Am Niagara Health focuses on people living our CORE values of compassion, optimism and achieving ambitious results.